I’d first heard of unions & environmentalists teaming up on climate adaptation when my friend Mitch Chanin alerted us of NYC’s Climate Works for All: A Platform for Reducing Emissions, Protecting Our Communities, and Creating Good Jobs for New Yorkers this past February. 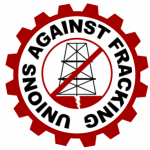 Now, another friend, Liz Arnold, alerted me of an international group, Unions for Energy Democracy, whose recent news bulletin stated “Thirty trade union bodies representing tens of millions of workers have issued a statement calling for a global moratorium on hydraulic fracturing (fracking) for shale gas, coal seam gas, and shale oil.” It appears to be led by Unions Against Fracking, a sub-group. Heartening that it isn’t just the near residents and environmentalists against fracking, that it’s also the tradespeople who will supposedly have jobs. If you represent a union in the Philadelphia area, we’d love to have you as an ally as we build the momentum for a Philadelphia powered by clean energy. Please contact me.